Check out Tobi's Direct Stripe Denim Crop Top It's double the denim with Twin the Label's Direct Stripe Denim Dark Wash Crop Top. This denim tube top features contrast stitching in a stripe print, a front zipper, and a tight fit. 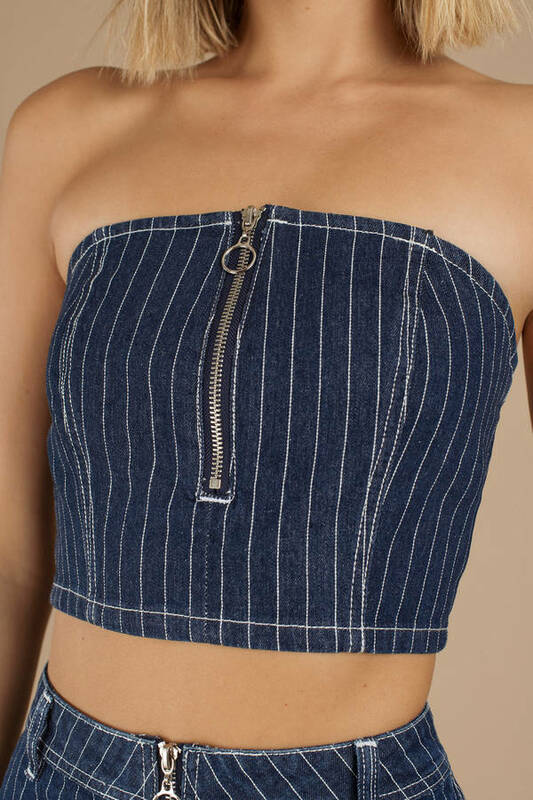 You have to pair this strapless jean crop top with its soul mate, the Direct Stripe Denim Skirt, at your next outdoor summer soiree. It's double the denim with Twin the Label's Direct Stripe Denim Dark Wash Crop Top. This denim tube top features contrast stitching in a stripe print, a front zipper, and a tight fit. You have to pair this strapless jean crop top with its soul mate, the Direct Stripe Denim Skirt, at your next outdoor summer soiree. Dark Wash modeled on a size Small.